Here in northern California, all four seasons spoil us with an embarrassment of riches. But I still love spring the most. I’ve got an ongoing experiment happening outside the front door. It started with one planter and about a thousand lettuce seeds. When those actually grew and I’d proved to myself that I could, in fact, grow plants successfully, we got a second planter, and then a third. Do you have a container garden? What grows well, and what doesn’t? Yes, we’ve been MIA for a few months. But we’ve put our hiatus to good use. Check it out! … and it turns out you shouldn’t plant 1000 lettuce seeds at once. Now I know. 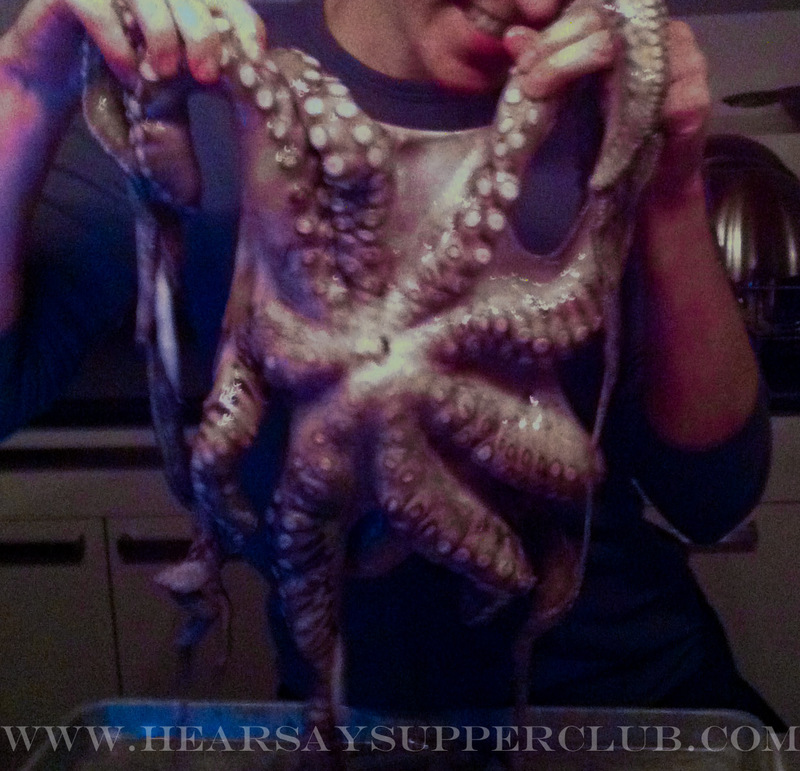 BTW: the great mystery of the best way to cook an octopus has been solved. Perhaps unsurprisingly, the winning preparation method involved confiting the octopus legs in duck fat. Just as everything is better with bacon–yes, even octopus–everything is also better once poached for four hours in 200-degree duck fat. The confit left the octopus meat evenly silky and tender, whereas none of the braised/roasted/simmered samples finished cooking without leaving the thick ends of the legs a wee bit dry. I bet Harold McGee didn’t see that one coming. Around here, duck is the undisputed Most Delicious and Magical Animal. But for me, octopus runs a pretty close second. Its satisfying meatiness, fun form factor (tentacles! ), and tendency to pick up subtle smoky flavors from surrounding ingredients make it one of those things I automatically gravitate toward on any menu. Done right, octopus is tender rather than rubbery. But there are a few things you need to know about cooking octopus at home. Most importantly: OCTOPUSES ARE NOT SQUID. If you try to cook them the same way, you’ll end up with something that resembles your rubber sink stopper. And nobody wants to eat that. You have essentially two choices for preparing edible octopus. You can barely cook it and serve it sashimi style–a great option if you fished the thing out of the ocean yourself and know exactly how fresh it is. But if you’re like me and can’t trace the provenance of your cephalopod past Sun Fat Seafood, you should probably make like an Italian grandmother and cook it slowly for a loooooooooooooong time before you grill/sear/sauce it. Harold McGee, food science expert extraordinaire, very eloquently explains why in this New York Times article. Basically, because octopuses don’t have bones, the muscle fibers in their arms have an enormous amount of connective tissue that gets tough and rubbery before it starts to break down between 190 and 200 degrees Fahrenheit. So whatever your final preparation for the octopus, you need to tenderize the meat first by heating it to that temperature for a few hours. We used McGee’s recommended method this week as part of testing for our Weird Wines dinner. After breaking down our monster five-pound specimen, we blanched it quickly and then cooked it in a dry, covered cast iron pot at 200 degrees for about five hours. The outer ends of the tentacles were awesome–tender, with a distinct but not overwhelming oceanic flavor. The body ends, though, were a little dry. Clearly we have some work to do on calibration of our cooking time. On the upside… dry tentacles mean I get to eat more octopus this week, and I’m not exactly sad about that. One other cooking method we’ll be trying: sous vide. McGee doesn’t mention this as an option in either his article or On Food and Cooking, but my theory is that heating the meat to 195ish degrees will work the same way whether the meat is in the hot oven air or a water bath. And perhaps by sealing the juices in the vacuum bag (octopus gives off a TON of liquid as it cooks), we can intensify the octopus flavor. So, talk to me. Have you tried cooking octopus? How did you do it? What worked and what didn’t?